In 2016 a sports bra seems like a better choice than a crop top. Wherever you go sneakers in all colors and shapes are catching your eye. Even high heel queen Victoria Beckham was caught wearing the comfy footwear. Inspired by the new found love of fashion icons and It-girls we decided to do the “Active wear feat. Nike”-photoshoot. A follow-up of our “Athleisure feat. Adidas” fashion shoot. Our model Valeriya was very excited to be part of our active wear shoot to get a refreshing change from fashion modeling and catwalks at Amsterdam Fashion Week. To give the images a vibrant and powerful look we chose a neon orange wall for our first location. 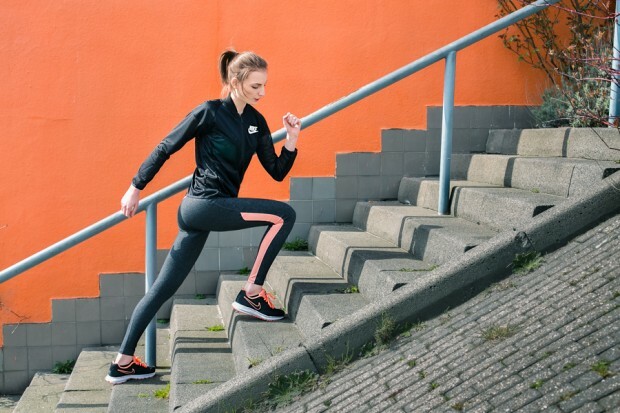 Workout on the stairs? Here we go! The second location for the “Active wear feat. Nike“ series was a dark grey wall in Amsterdam Noord. The structure of the wall resembles the grey pants and is giving the dark outfit an almost elegant look. The pink elements are giving the image a lively splash of color. Our final location choice was on the riverside in Amsterdam Noord. The strict lines of the water and the city skyline in the back are giving the image a symmetrical structure. By using the skyscrapers as leading lines, the focus of the viewer is always being pulled back to the model.